The Hive theme helps you to build beautiful, responsive websites with ease. It comes packed with theme variations and color pickers that allow you the ability to customize each page's look and feel with just a few clicks of the mouse. You'll be building portfolios, blogs, customer sites and more in no time! The Hive theme aims to make your site building experience as hassle-free as possible. We've included theme variations that let you customize your banner images, site background, your font choices, and color options, and a whole lot more, with just the click of your mouse. While the Hive theme is quite beautiful to look at, our first goal is to make your images and content the star of the show. Bold banners, beautiful background and a clean, clutter-free design will help to focus your visitors' attention where it should be – on your content. Hive has 45 different color pickers to help customize each page of your site. Includes 15 custom banners, site backgrounds and ExtraContent area backgrounds, each. Use the 8 provided ExtraContent areas for create unique sections on your pages. Hive is built using Foundation's responsive framework as its basis for its flexible layouts. This allows your visitors to see your site as you intend it, no matter what device they're viewing it on. Hive lets you not only customize banner images, but you can use your own imagery for the site background as well as many of the ExtraContent areas' backgrounds. Hive comes with 8 different ExtraContent areas. Some of these ExtraContent areas can have translucent backgrounds, allowing the site background to show through, or your can use your own images instead. One ExtraContent area can even serve as a replacement for the site banner as well. We've built a site navigation that works beautifully on both your visitor's desktop and mobile devices. It provides a nice drop down with a variety of options for customizing it for your site. We've also included a secondary navigation that is placed in the sidebar of your pages when the sidebar visible. We've included 45 different color pickers in the Hive theme! These allow you to tweak the look and feel of your site, on a page-by-page basis, to make your site look just right. Enhance your Photo Album pages with our built-in Lightbox. Create your Photo Album using RapidWeaver's built in album page style and then simply enable the Lightbox in Hive's toggles section. What else can Hive do? Have an in-depth look at all of the Hive theme's features on the Options page. Also, be sure to check out all of the Sample pages that show off how the theme looks and functions with both the standard RapidWeaver page styles and some of the more popular 3rd-Party page styles, like Stacks. The Hive theme comes with a lot of responsive functionality built right in to make your life super simple. Making your content responsive can be just as easy. Check out our Structure, Ivy and Orbit stacks, all of which are showcased throughout this preview site. A suite of responsive layout and design tools for building supremely flexible page designs in Stacks. Structure features responsive columns, grids, floated images and a whole lot more. An image and content slider, all-in-one, for your Stacks pages. This super configurable stack is perfect for making responsive slideshows and banners, and much more. 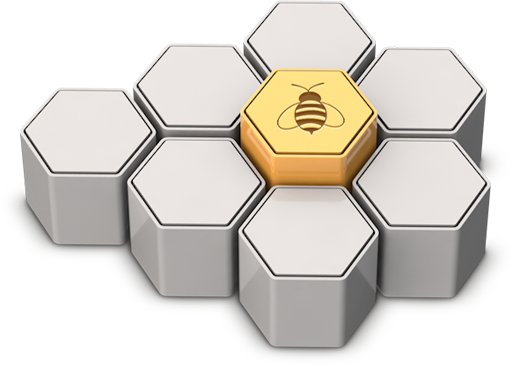 The Hive theme is built to work great in the new RapidWeaver 6. We've also made sure that it will work in RapidWeaver 5 for those that have yet to get around to updating. It's important nowadays to make sure your site works well on both desktop computers as well as mobile devices such as the iPad and iPhone. Hive makes sure your site looks good on these platforms via its responsive design.